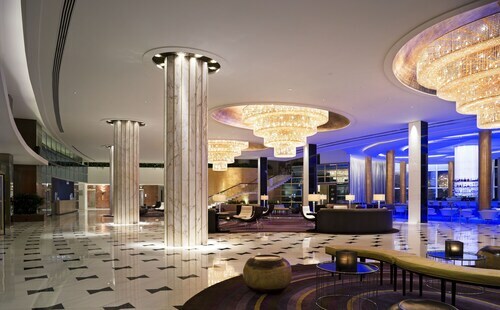 This famous Miami Beach hotel rises above 1,000 feet of Atlantic Ocean beach, just 2 miles from shopping on Lincoln Road and 3 miles from Miami's South Beach. 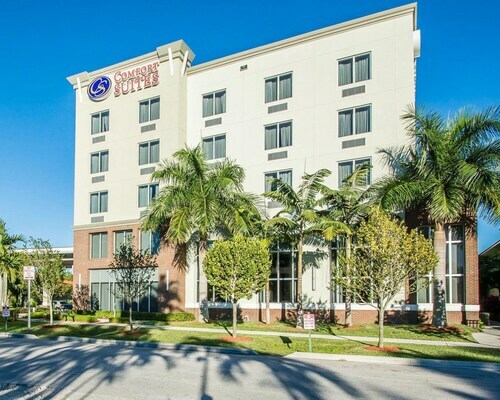 Situated in the airport, in Miami, this hotel is close to Curtiss Mansion, Grapeland Water Park, and Miami Springs Golf Course. 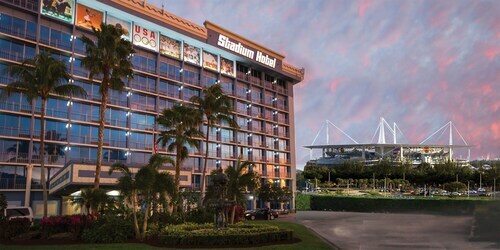 Also nearby are Miami Jai Alai and Magic City Casino. 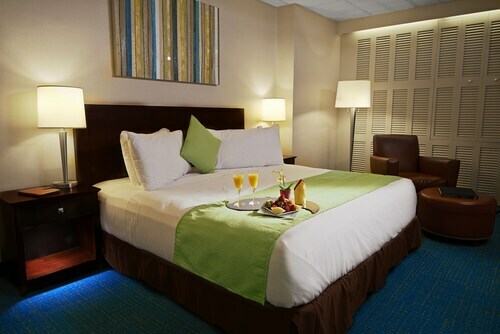 Situated near the airport, this hotel is within 1 mi (2 km) of Curtiss Mansion and Miami Springs Golf Course. Miami Jai Alai and Grapeland Water Park are also within 3 mi (5 km). 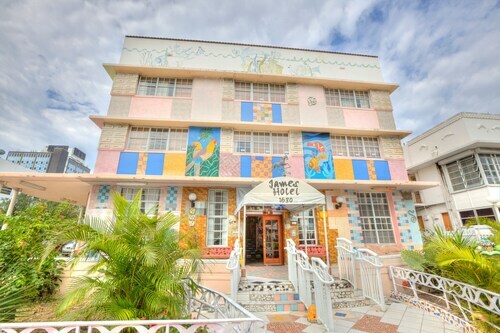 Located in Mid Beach, this hotel is within 3 mi (5 km) of Indian Beach Park, Miami Beach Boardwalk, and Surfside Beach. 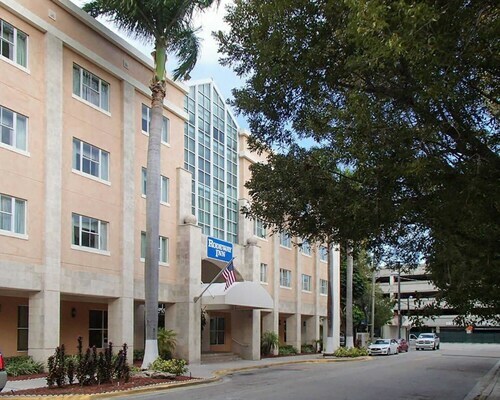 Mount Sinai Medical Center is 2.8 mi (4.6 km) away. 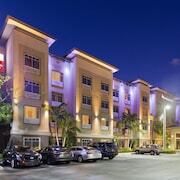 Located in south Miami, this hotel is 2 blocks from The Shops at Sunset Place, 1 mile from the University of Miami, and about 4 miles from downtown Miami. Miami International Airport is 6 miles away. 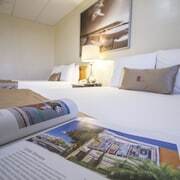 Located in South Beach, this hotel is within a 5-minute walk of Espanola Way and Washington Avenue, Collins Avenue Shopping Area, and Lincoln Road Mall. Miami Beach Boardwalk and Miami Beach Convention Center are also within 10 minutes. 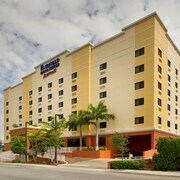 Located in Miami Springs, this hotel is 2.5 miles from both Miami International Airport and Hialeah Racetrack. Magic City Casino is 3.5 miles from the hotel. 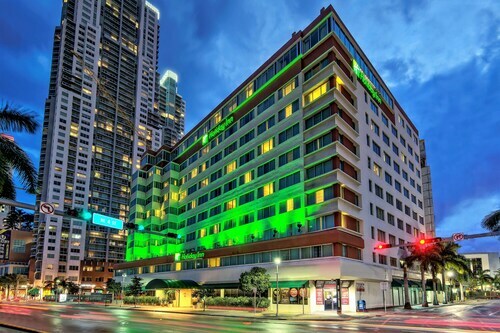 Located in Downtown Miami, this luxury hotel is within 1 mi (2 km) of Miami Exotic Auto Racing and Miami Convention Center. Port of Miami and Vizcaya Museum and Gardens are also within 3 mi (5 km). This historic oceanfront hotel features a private beach area and has 3 onsite restaurants. Miami Beach Convention Center is within a 10-minute walk of the hotel. 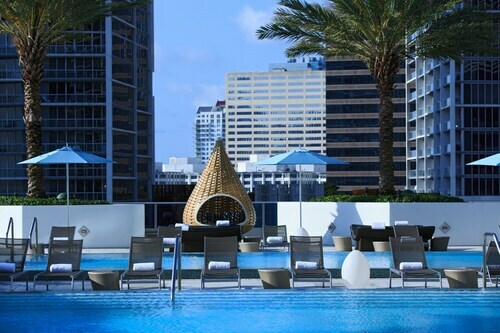 Shopping at Lincoln Road Mall, dining, and entertainment venues of South Beach are just blocks away. This expansive golf resort in Aventura is two miles from Sunny Isles Beach, six miles from Bal Harbour Shops, and a half-mile from the Aventura Mall. South Beach nightlife is 20 miles away. How Much is a Hotel Room in Miami? 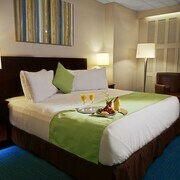 Hotels in Miami start at C$65 per night. Prices and availability subject to change. Additional terms may apply. Greater Miami has two major international airports: Miami International (MIA), which is six miles west of downtown Miami, and Fort Lauderdale (FLL), which is about 26 miles north of downtown. Transportation from both locations includes car rental services, bus, and—if you’re traveling from MIA—the Metrorail, a monorail system connecting MIA with 13 major Miami destinations for just $2.25 per ride. Miami traffic ebbs and flows; traveling from MIA to downtown can take as few as 15 minutes, but be prepared to allow up to 45 minutes depending on traffic patterns. Withvery few exceptions, the best way to get around Miami is via rental car. Miami neighborhoods can be sprawling, and the city’s few public transportation options are limited in scheduling and reliability. If you mostly plan on staying in or around your resort, the Metrorail system is a very efficient and cost-effective way to shuttle you to and from Miami International. Otherwise, the only scenario where you won’t need a rental car is if you’re staying on Miami Beach, which is a uniquely pedestrian-friendly part of the Magic City! 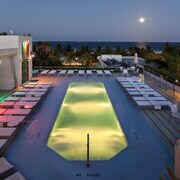 South Beach is the undisputed nightlife capital of South Florida—if not the country. With plenty of Art Deco architecture and neon lights to go with its sand and surf, South Beach might blend natural beauty and human entertainment better than anyone else. Start your South Beach journey anywhere on Ocean Drive between 5th and 17th Streets, an area so chock-full of shoreline, nightclubs, and restaurants, it would take months to fully explore. Known affectionately by locals as simply “The Gables,” Coral Gables offers a beautifully manicured lawn-and-picket-fence contrast to the glitz and glamour typically associated with Miami. Home to the gorgeous University of Miami campus, Coral Gables also hosts some of Miami’s most selective golf, shopping, and restaurant options. For a fantastic dinner you won’t soon forget, head to Palme d’Or in the Biltmore Hotel, which always seems to make an appearance on lists featuring Miami’s best restaurants. 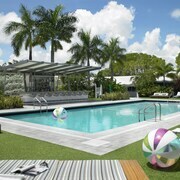 Located just 10 minutes north of downtown Miami, Wynwood is unquestionably Miami’s hottest up-and-coming neighborhood. Famous for its lunch spots, coffee shops, and boutiques, Wynwood is the perfect place to spend a few daytime hours while your nightlife plans take shape. Here’s a tip: Check out the Wynwood Walls (NW 2nd Ave between NW 25th and 26th Streets) for a series of outdoor gardens featuring expansive murals created by local and international artists. While Miami’s natural beauty and diverse entertainment are enough to make it one of the country’s top vacation destinations, its cultural fabric is indelibly tied to its Cuban-American population. Little Havana is famous for its Latin American art galleries and walk-up coffee shops—so patrons don’t have to put out their cigars! Though technically occupying the chain of islands (or “keys”) just south of Miami and the Florida mainland, the Florida Keys are among America’s most geographically unique and stunning landmarks. 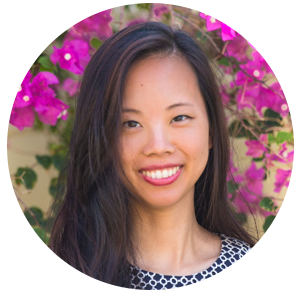 Though Key West and Mile Marker 0 are three-and-a-half hours away from Miami, many other Florida Keys hotspots including Key Largo and Islamorada are within an hour or two of downtown Miami. For an unforgettably luxurious afternoon, head to Islamorada’s Cheeca Lodge for a freshly-caught seafood lunch and beach stroll! Foodies will love Miami—the Magic City's cosmopolitan heritage is deliciously reflected in its restaurant scene. For a bona fide Miami institution, check out Joe's Stone Crab, which features fresh stone crabs, key lime pie, and much more in a gorgeous Miami Beach setting. For the best of Miami's overflowing fine dining scene, check out South Beach's Prime 112 (steakhouse), Coral Gables' Cibo Wine Bar (Italian), or downtown Miami's Zuma (Japanese). Since it would be a crime to leave Miami without trying authentic Cuban fare (or at least it should be), make sure you head to Little Havana's famed Calle Ocho and grab a Cuban coffee, plantain sandwich, and slice of pie from world-famous Cafe Versailles! Staff is amazing. There’s always maintenance work being done to keep the hotel looking well attended. However, the rooms smelled musty. The breakfast could be better. We stayed 3 nights, and all three mornings the bananas offered were rotten. Not overripe …rotten. I’d still stay there again. 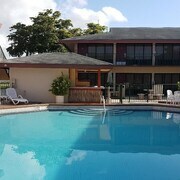 Good hotel @ great location, staff need at front desk needs to be a little more courteous and helpful!. My family had a great time! A lively place with a variety of patrons. Fun people watching at the pool. Resort price gauging annoying along with prestocked mini fridge and unhealthy candy in the room. The architecture and history are great, a classic. Loved it all the staff was extremely helpful , they went out of Their way to help us give us water , help us whith our bags , laritza was very helpful , Fernando the best and the staff from the excursion, very helpful, thank you all for making our stay the best, the staff at the restaurant were not to friendly!! Loved pool area with a bar. Staff was friendly and helpful.